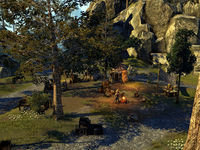 Crossroads Encampment is a campsite found east of Dragonstar in Upper Craglorn. It was set up by a group of scavengers who have been salvaging weapons and armor from the battlefields of Cyrodiil. The Crow's Pickings — An armor stall owned by Severa Mamilus.